Frederick, Maryland is truly a crossroads for the state of Maryland. There are few places that have more history than Frederick, Maryland but it is not just Maryland's museum. In the summer there is nothing like taking in a baseball game at Harry Grove Stadium. Some of major league baseball's biggest names began with the Keys so you are truly watching tomorrows stars today. There are some great shops downtown on Market Street and Patrick Streets. There are also some really great restaurants to satisfy your taste pallet. If you just want a peaceful moment to yourself there is Baker's Park right downtown. You never feel that you are in the second largest city in Maryland no matter where you are. But what really makes Frederick, Maryland the place to go is its history. Originally called Fredericktowne its rich history goes all the way back to the French and Indian War. During the American Civil War, Frederick, Maryland was the cross roads of battle. From being the place that the Maryland legislature proposed going to to vote on secession before Lincoln placed them all in jail and kept Maryland in the union, and also Lee's stopping point to regroup before Antietam, to being the site of the battle that saved Washington on the Monocacy River, Frederick, Maryland is history. 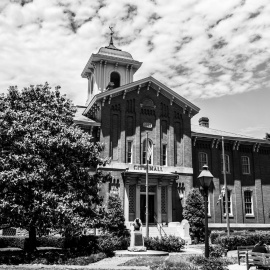 Today you can follow the Civil war trails in downtown Frederick, tour the Monocacy battlefield or take a tour of the National Museum of Civil War medicine on Patrick Street. If history is your thing you can truly immerse yourself in it at Frederick, Maryland. Finally when it is time to turn in after a day of adventure Frederick, Maryland has some great places to stay for the night. Frederick is truly America's and Maryland's crossroads. Don't miss it. Relish Decor and Colonial Jewelers present the Downtown Frederick Wedding Walk! Sponsored by Frederick Weddings. Join us April 27th to meet your vendors, do some shopping, win some prizes, and get excited for your big day!